Correctly use the 2018 NFPA 70E® to assess risks and protect personnel against electrical shock and arc flash hazards. Review concepts and earn your Certificate of Educational Achievement* online! Each year, electrical dangers in the workplace cause hundreds of deaths and thousands of injuries. NFPA 70E, Standard for Electrical Safety in the Workplace® -- the Standard originally developed at OSHA's request -- is the key to saving lives, reducing liability, and avoiding loss due to electrical incidents. 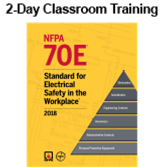 NFPA®'s clear, authoritative instruction teaches you how to apply the 2018 edition of NFPA 70E to assess electrical risks and reduce employee exposure to potentially deadly hazards. The 2018 NFPA 70E Classroom Training also offers a Certificate of Educational Achievement* available after the course through an online review and exam. Earn the Certificate to demonstrate proficiency in your understanding of seminar topics. After attending classroom training, review key concepts online and take the online exam at your convenience using the web link provided. You can prepare for the test in your own time frame, using online tools for review. Passing the exam will earn your Certificate of Educational Achievement*, confirming your course knowledge. Certificate does not fulfill all requirements of NFPA 70E 110.6(D)(1) for "Qualified Person". See the Certificate FAQs Tab for more information on purpose, limitations of NFPA Certificates, and Course Objectives. Who Will Benefit: Electrical engineers, safety managers, electricians, electrical contractors, plant managers, facility maintenance personnel, electrical inspectors, risk managers, mechanical engineers, HVAC installers, designers, and project managers. Earn 14 hours or 1.4 CEUs for this 2-day NFPA 70E Classroom Training. Attendance is required to earn CEUs. Please verify applicability with your professional board or organization before attending.